I go back and forth with baking. I always love to do it but there are times, (after multiple failures,) that I feel I am just not very good at it. I must admit, I have WAY more failures while baking versus cooking and just when I think I am going to give it up completely I come across a gold mine of a recipe. After completely under cooking an entire batch of cupboard cookies (Note to self: buy new cookie sheets because they were the problem. It was not my lack of enthusiasm of baking that day!) I was completely baffled that after almost 10 years baking I could under-cook cookies? But to be honest... these things just happen and mistakes are often made. 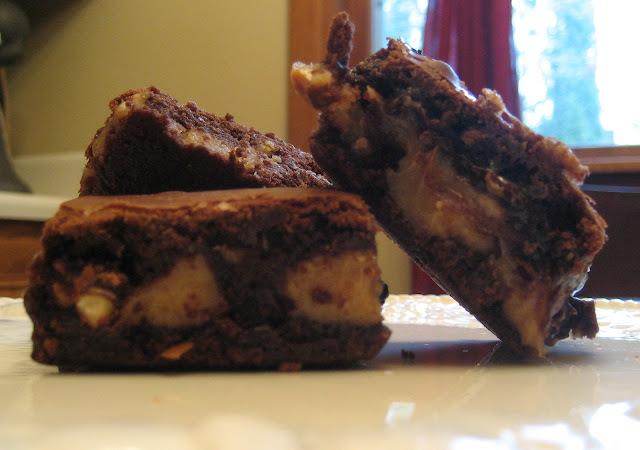 I was 100% re-assured that I can bake after making these quite delicious, can't stop eating them peanut butter brownie bars. Makes: Approx. 24 small bars. In the bowl of your electric mixer with the paddle attachment, combine brownie mix, eggs, oil, and vanilla. Beat until combined. Stir in peanuts and butterscotch chips. In a separate bowl, whisk together sweetened condensed milk and peanut butter in a medium bowl until smooth. To assemble the bars, spoon half of the brownie mixture into the bottom of your baking pan. Put in freezer to allow to set for about 5-10 minutes. Next, add the peanut butter/milk mixture to the top of the brownie mixture. Freeze for another 5-10 minutes to harden the layer of peanut butter filling. Top with the remaining mixture of brownies. Bake in pre-heated oven for 25-30 minutes until center of brownies are "set" and the edges are lightly browned. Cool completely in pan before removing. Cut into small or large sized bars and enjoy!